Our first reaction to Mitty is one of horror, revulsion and disgust. Mitty is grotesque, a mockery of life. Little more than a mass of flesh and fur, with less a mouth and more a gaping opening out of which she wheezes, her formlessness is bizarre and unpleasant. Nanachi’s initial explanation does little to minimise that – Mitty suffered the effects of going up from the 6th layer, losing her humanity. No intelligence or semblance of her personality remains. But that still leaves so many unknowns. Is she harmless? She’s certainly not aggressive, and her strange, weak mewls just make her seem pathetic. But neither does she seem safe – the way she’s drawn to the unconscious Riko and just… sits on her, ‘face’ pressed against hers, is deeply discomfiting. Mitty is something that shouldn’t be, and we can’t begin to know or understand. That is enough for horror. Mitty inspires a kind of pity, but not really empathy – she’s just too alien for that. And really, the pity she inspires is more of a side effect of the sadness with which Nanachi cares for her – Mitty is caught in the halo of our empathy for Nanachi. It’s not until we learn of Mitty’s past in vivid, visceral detail, and the true horror surrounding her, that we begin to care tremendously. I’m sure I don’t need to recap it. 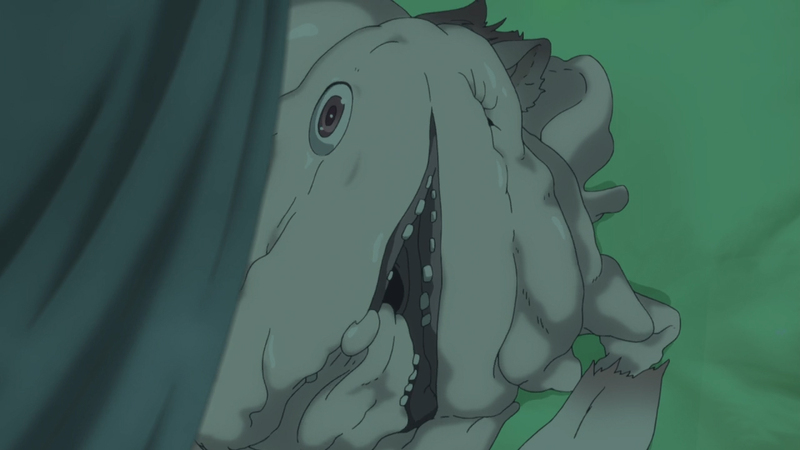 No words I put down could possibly do justice to the sheer, gut-wrenching body horror that created – distorted – Mitty. A traumatic experience for Nanachi and a deeply, truly horrifying experience for myself, it left me feeling among other things guilty for my initial reaction towards Mitty. Whereas before I was repelled by her, now I desperately wanted her to be protected and saved. She’s nothing more than a victim in all of this, and the disgust levelled her way is only another layer of unfairness she doesn’t deserve. How can you not feel for someone rendered so pathetic? To lose everything that she is and to not die at the same time – to have her soul trapped and suffering inside a body that is no longer present and aware – is painfully tragic. That sudden swing of empathy was only as large as it was because of my initial reaction to her, though; the power of her backstory would never have been so strong if my feelings didn’t have to travel so far so fast. And with those deepened feelings, Made in Abyss could deliver emotion on a different scale. Nanachi’s relationship with Mitty was immediately reframed with knowledge of their history. It provides an explanation as to why Nanachi keeps something so apparently unpleasant and useless around – Nanachi loves her. Nanachi has remained casual about the entire time, speaking of Mitty as if she were more a pet than the remains of their closest – their only – friend, but the lengths they have gone to to comfort and care for her despite everything proves Nanachi’s real feelings. 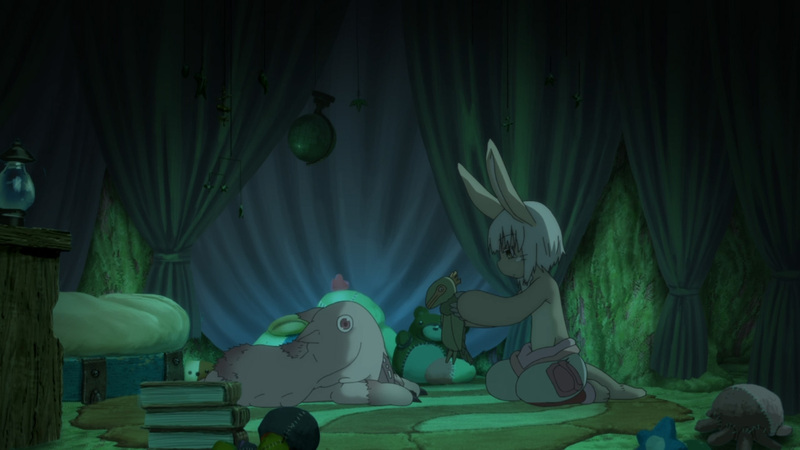 It shows in the way Nanachi calls Mitty “my treasure”, the way Nanachi looks and speaks gently to her, and the cosy little room Nanachi made for her. That room, I think, shows the complex feelings best – Mitty lies there, surrounded by soft toys. It’s quietly tragic. Nanachi wants Mitty to be happy even if Mitty doesn’t have the capacity to feel or express it anymore, but because she’s regressed so much Nanachi has resorted to something so simple and infantile for lack of better options. It’s heartbreaking. Eventually, Nanachi works up the courage to ask Reg to kill Mitty. The weapon in Reg’s arm has the power to kill her – she had been caught in it before apparently, and lost an eye – and is possibly the only thing with the power to kill her. 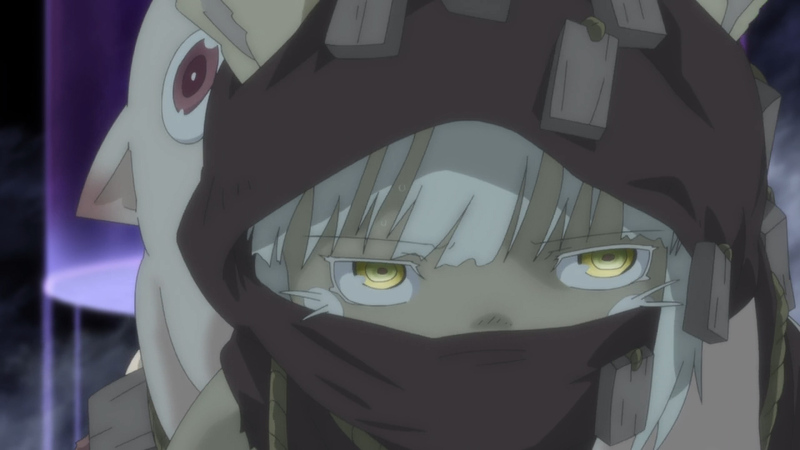 See, when Mitty and Nanachi were experimented on, unlike the other children all of the curse Nanachi experienced was transferred to Mitty, rendering her immortal (and allowing Nanachi to survive with humanity intact). Mitty will never know peace. Nanachi has tried desperately to find a way to either bring back Mitty or end her suffering, and until now has found nothing. Even after Nanachi dies, Mitty will live on, but without anyone to understand who or what she is and nobody to care for her. Her soul will be trapped for eternity. Mitty’s horror isn’t simply body horror – it’s existential. Nanachi doesn’t push him, but is nonetheless visibly relieved when Reg agrees. What follows is the most hearbreakingly beautiful scene of the year. Nanachi lays a bed for Mitty out in the field behind their house, and puts all her soft toys there with her. Mitty doesn’t really acknowledge any of this, lamely chewing on a toy. It’s reminiscent of having a pet put down – they can’t understand what’s happening, but nonetheless they’re made to be in as much comfort as possible for the end. That Mitty – a bright, cheerful, energetic young girl – would see her end like this hurts. Nanachi strokes her head and says they’ll meet again soon enough, before stepping back and telling Reg to fire. 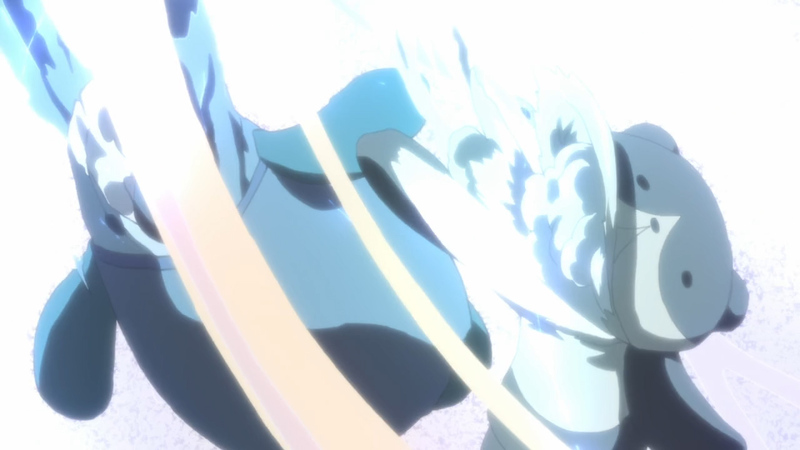 Reg raises his arm, takes aim through the tears, and starts powering up to end it all – but Nanachi cries out. 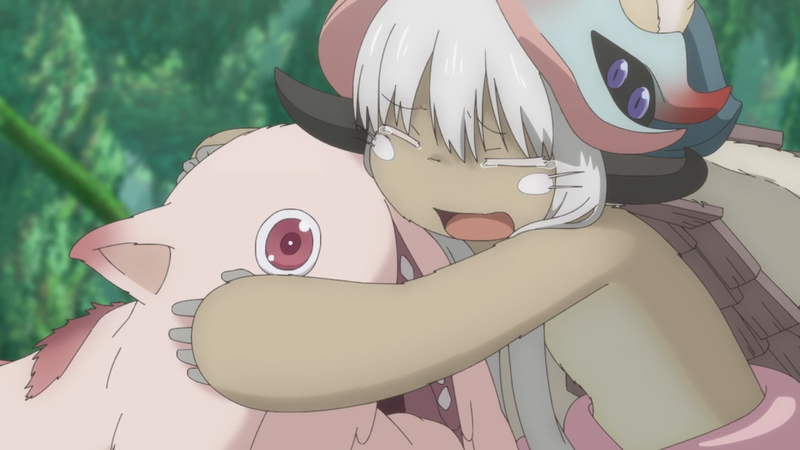 Bursting into tears, Nanachi runs and embraces Mitty, saying sorry over and over and over again. Mitty means the world to Nanachi. Nanachi may not have been emotionally explicit about it, but it’s true. They can’t see her off so easily like that. Not without saying sorry. The guilt Nanachi must have been carrying – being indirectly responsible for Mitty’s fate, the survivor’s guilt, being unable to help her, intentionally poisoning her to create antidotes, opting to have her killed – must have been immense. The weight of it all, alongside their unreciprocable love, all came together in their last moment, desperately refusing to let it end like that, not without apologising. There’s so much love there, and it’s so painfully bittersweet. Nanachi is crying and embracing Mitty, wishing she could have found a better answer… but Mitty just doesn’t comprehend what’s happening. She just sits there, not even confused. It’s tragically one-sided – or rather, tragic and one-sided because of cruel tragedy and tragic cruelty. Nanachi is eventually able to step away from their final moment with Mitty that they didn’t know they wanted or needed. Reg fires. It’s violent – a colossal ball of pure white fiery energy that leaves a deep crater. Mitty’s toys disintegrate – an apt image of both her and Nanachi’s stolen childhood – and Mitty along with them. And as she’s consumed, she’s as oblivious as always. It dies down, and Reg starts to well up. Of course he would – he’s gone through the same arc as we have with Mitty, coming to care deeply for her after learning her background. He’s grateful to Mitty too – thanks to her immortality, she created the antidote saving Riko in her body as a reaction to the poison. And it’s the first time he’s had to make a mercy killing. Of course he’d cry. But before a single tear rolls down his cheek, Nanachi bursts into pained, wailing sobs. The first friend they’d ever made, the person closest to them, the one they loved dearly who had suffered so greatly, was now well and truly gone. Mitty had been gone for a long time – and Nanachi knows this – but her soul was still there. She was still there. And now there’s nothing. Nanachi’s treasure, finally gone. And with that – with no-one to be strong for anymore – Nanachi finally cries. For losing Mitty for the second time. For losing Mitty for the first time. For the unfairness of the world. For the cruelty she went through. For the guilt, the pain, the suffering, for everything they had gone through over the years. Years of sadness bottled up, finally bursting out in overwhelming grief. The depth of Nanachi’s love for Mitty is finally expressed, purely and sorrowfully, as every last wall she put up collapses under the weight of the finality of the loss. I cried. With Nanachi and Reg, I cried. At Nanachi’s loss, at the depravity of man, and at how Mitty – poor, pitiful Mitty – didn’t deserve this. Mitty didn’t deserve to die. Mitty didn’t deserve to lose her humanity. All this horror and cruelty, Mitty didn’t do anything to deserve any of it. The world is cruel, the world is not kind, and because of this Mitty was suffering. Worse, she wasn’t even aware she was suffering. Death had been left as her only escape – and until Reg showed up, even that was not an option. Reg will now have to share in the burden – he took an innocent life, after all. But he did the right thing. Nanachi chose the right thing. Just… why did it have to be the right thing? Horror and empathy go hand in hand. Would Mitty’s death – her release – have been anywhere close to as affecting had we not initially feared her? Only through horrifying us could we have come to understand Mitty so closely. And only by understanding her so closely could we have cared for her so deeply. And only then could we truly feel the tragedy of her ending.